There are, briefly, two remarkable things about the Quatuor –the first is one that will be experienced by only three people, and the other is one that will be experienced by a few more (and both, fortunately, can be discussed by anyone interested in watches and horological problems, without having to actually own the watch.) As to the what, it is a watch, available in either a silicon or pink gold, which contains a new movement –the calibre RD101 –which is fitted with not one, but four balances, each inclined at an angle to both all the other balances and to the vertical and horizontal planes. The balances are linked by a differential, and the time shown is the average rate of all the balances together. As to why, there are several answers. The first is that of the two possible case materials one is rather revolutionary; a watch case has never been made in silicon before and the Quatuor –in a limited series of 3 pieces –represents the first use of silicon for a watch case, rather than for a functional component of the watch movement. 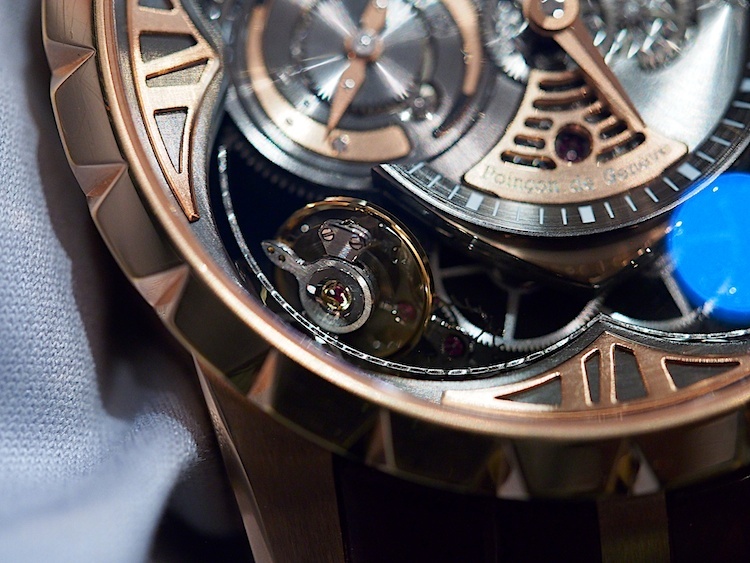 The considerable technical obstacles to making such a large object from silicon were addressed by Roger Dubuis in association with a firm outside the Richemont Group with expertise in exotic materials, but beyond that, we could obtain few details as there are patents pending on the process. Pure silicon can be grown into thick boules and the seminconductor industry routinely grows monocrystaline boules up to 300mm thick, but whether such a moncrystalline boule was the base for the case manufacturing process, we don’t know. A major challenge would certainly have been machining such a thick object to the necessary shape –ordinary etching methods used for the manufacture of integrated circuits are limited to a depth of about 10 microns, and even DRIE –Deep Reactive Ion Etching –has not, to our knowledge, ever been used for such a thick object before; the case is 48mm across and necessarily thick due to the size of the movement. Three of the watches will be made in silicon. A further 88 will be made in pink gold, though both versions house the same four oscillator movement. The idea behind the movement is to create a watch that addresses –and solves –the same problem that the tourbillon’s designed to address, which is that a watch runs at different rates in different positions due to the varying effects of gravity on the escapement and oscillator. The tourbillon is intended to create a single average error for all the vertical positions –it’s then the watchmaker’s task to adjust the watch so that the vertical and horizontal positions have the same error rate, and then regulate the watch so the net gain or loss is as low as possible. Historically tourbillons were very hard to make –getting them to run at all required a great deal of manufacturing skill –and making them and adjusting them well enough to really reap any real long term benefit was and is beyond the reach of most individual watchmakers or watchmaking firms. The Quatuor is an attempt to go at the problem from another angle. The balances are arranged so that (or at least, this is the hope) if one balance is in a position where it’s losing on its rate, another will be in the opposite position and the two errors will cancel each other out. This approach is not necessarily any less expensive or technically challenging, at least for now –the Quatuor in silicon will set back the well heeled and intellectually inquisitive connoisseur around a million Swiss francs, and in pink gold 380,000 of the same. Adjusting the watch involves much more than just adjusting four balances to run with as little error as possible and hoping for the best –for one thing, since regulator indexes are fitted to balance springs and the position of the regulator curb pins with respect to gravity is one of the influences on rate variation, that’s a significant factor (among many) that whomever’s got the task of adjusting and regulating this watch would have to address. 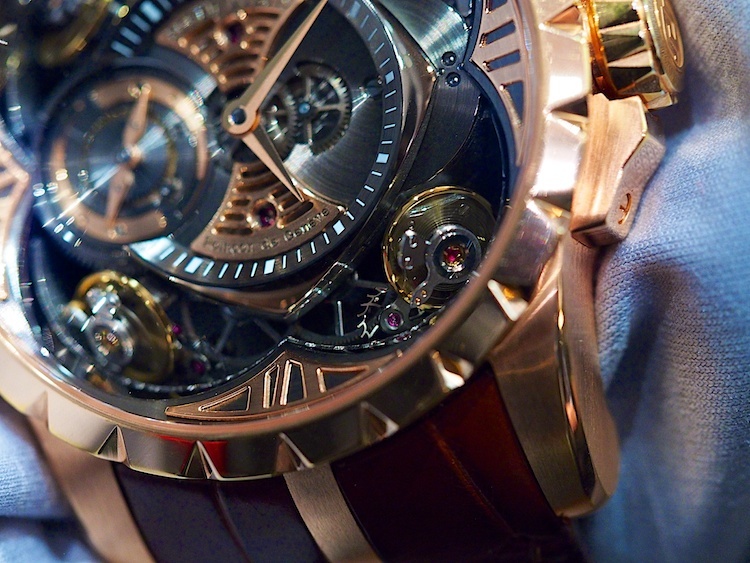 As the great historian of science, Jacob Bronowski (The Ascent of Man) once wrote, apropos the Japanese katana, the most basic and important question, aesthetics aside, is “Does it work?” The answer at least for now is that we don’t know –the watch is barely out of the prototype stage and Roger Dubuis is still actively gathering data on long term performance. The theory, however, is sound –at least as sound as that behind the tourbillon –and there’s no denying that your chances of seeing anything else like it are very slim indeed (currently the only other multi-axis, multiple balance, non-tourbillon watch we’re aware of is the Greubel Forsey Double Balancier 35 degrees, which we’ll cover shortly.) By the way, it’s of interest that the name “Quatuor” is not some random piece of euphony concocted by the marketing department –it’s French for “quartet” and is a formal musicological term. Whether the four oscillators of the Quatuor can make beautiful music together functionally only time will tell, but it’s one hell of a watch to watch. 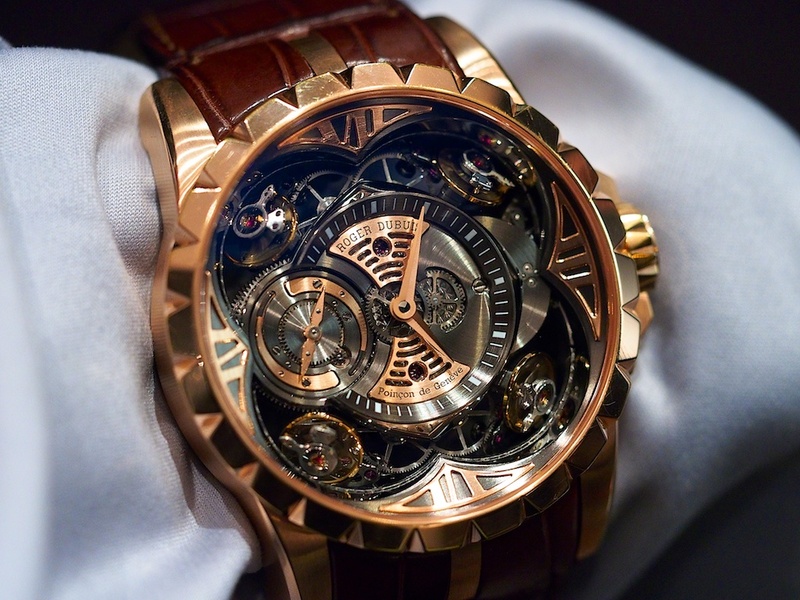 Find out more about the Quatuor from Roger Dubuis.